The Kuala Lumpur Tower is a tall tower located in Kuala Lumpur, Malaysia. Its construction was completed on 1 March 1995. It is used for communication purposes and features an antenna that reaches 421 metres (1,381 feet) and is the 7th tallest freestanding tower in the world. The roof of the pod is at 335 metres (1,099 feet). The rest of the tower below has a stairwell and an elevator to reach the upper area, which also contains a revolving restaurant, providing diners with a panoramic view of the city. Races are held annually, where participants race up the stairs to the top. The tower also acts as the Islamic falak observatory to observe the crescent moon which marks the beginning of Muslim month of Ramadhan, Syawal, and Zulhijjah, to celebrate fasting month of Ramadhan, Hari Raya Aidilfitri and Aidiladha. The tower is the highest viewpoint in Kuala Lumpur that is open to the public. The KL Tower is the seventh tallest telecommunication tower in the world (after Tokyo Skytree in Japan, the Canton Tower in China, CN Tower in Canada, the Ostankino Tower in Russia, the Oriental Pearl Tower in China, and the Milad Tower in Iran). Built to enhance the quality of telecommunication services and the clarity of broadcasting, KL Tower is a symbol of Kuala Lumpur. The foundation base houses three basement floors for safety purposes, storage and maintenance work. The touristic building bears the administration office, souvenir shops and the 146 metres long pedestrian mall with cascading pools. The tower shaft comprises 22 levels with four elevators and flights of stairs with a total of 2,058 steps. The tower head holds the public observation platform (276 m) and revolving restaurant, as well as the telecommunication and broadcasting stations. The antenna mast crowns the tower and is utilised for telecommunication and broadcasting transmissions. When constructing the KL Tower, the builders took special care to construct a retaining wall around a 100-year-old jelutong tree (Dyera costulata). The tower was moved at a cost of RM430,000 to avoid harming the monumental tree, which is found near the pedestrian mall. KL Tower is managed by Menara Kuala Lumpur Sdn. Bhd., a wholly owned subsidiary of the Telekom Malaysia Group. 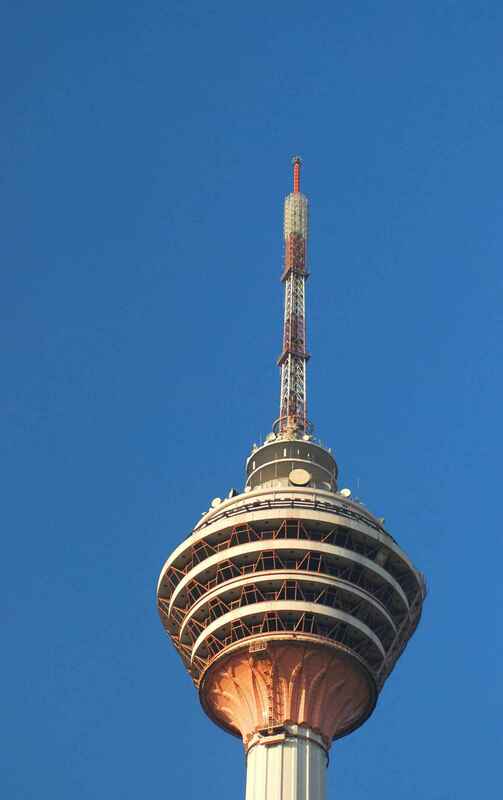 KL Tower is also the first pit-stop in The Amazing Race Asia 1 and fielded a route marker on the final leg of the same race. The Tower is located on Jalan Puncak, which branches off from Jalan P. Ramlee. Even though they're not very close, the closest rapid transit stations would be Bukit Nanas Monorail station and Dang Wangi LRT station. 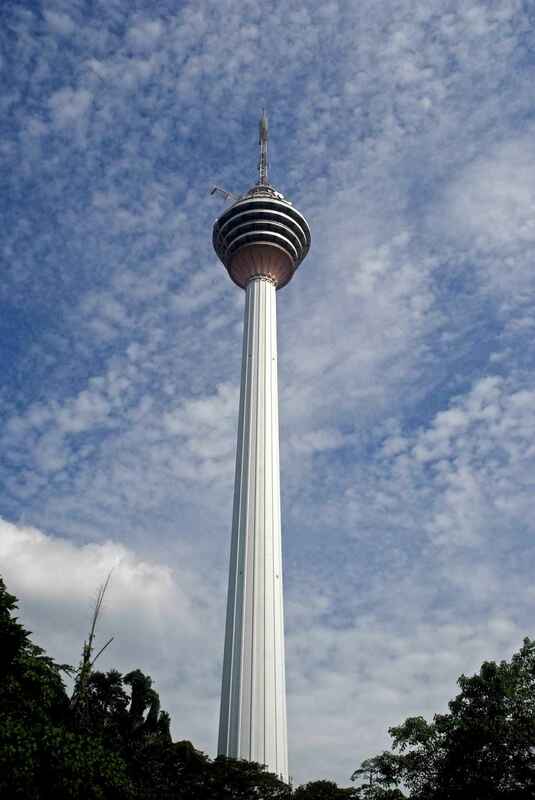 Kuala Lumpur Tower | eTips Inc.